If you’re looking for a better way to floss your teeth, consider a water flosser. Believe it or not, the best water flosser is actually more effective than regular floss plus they can even get the gum line clean. We researched some of the newest products and best-known brands to put together out best waterpik reviews. Our teeth are super clean and we’re ready to share the best products with you. But first, let’s take a look at the features you need to know. Cordless: Cordless flossers are a little easier to maneuver and ideal for travel. They also take up less counter space. The water reservoirs are a little smaller, though, so you will need to refill them more frequently. Pressure Settings: The number of pressure setting vary quite a lot between different models. Some have as few as 3 while others have up to 10! The more settings you have, the more versatile your water flosser will be. FDA Approved: Some of these are FDA approved, some are not. There’s not really any need to worry. Because these aren’t prone to causing serious harm, they don’t necessarily need to be FDA approved. There are some of each here! Flossing Tips: This is the number of how many tips are included with the flosser. Sometimes, this means that there are that many different types of tips. Other times this means that there are a few of the same tip included. Reservoir Capacity: The reservoir holds a certain volume of water and the capacity is an estimate of how many seconds that volume will last while you’re using the flosser. This will vary by the setting and tip you use. Warranty: The longer the warranty, the better. That’s true with everything. With electronics like this (especially that are used close to water) you should know what is covered and what isn’t. That way you won’t be surprised if something happens. You’ve read about the important features and we hope you have a good idea about what to look for when shopping for water flossers. With that, we can move onto our reviews. In a hurry? Check out the top and budget picks first. They’re right at the beginning so you won’t have trouble finding them. After that, you can learn more about the items that round out our list if you keep reading. Okay, let’s get started! Our pick for top water flosser is from Waterpik. It’s their most advanced design yet and it truly does have a lot to offer. For starters, it’s compact and won’t take up a lot of room on your bathroom sink or countertop. It’s easy to operate, too. The on/off switch is right on the handle and controlling the pressure is easy to do with just the tip of your finger. LED lights display your settings, either floss or massage. Need help keeping track of how long you’re supposed to be flossing? This one has a 30-second pacer and a 1-minute timer. And here’s how you know you can trust this product to clean your teeth. 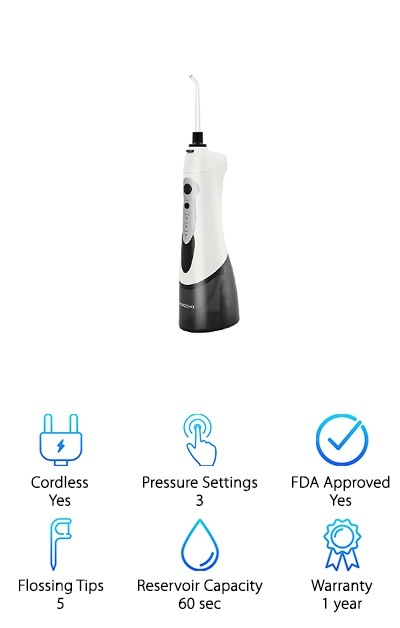 This is the first gadget of its kind to be accepted by the American Dental Association. We picked this flosser from h2ofloss as the best waterpik for the money. Here’s why. To start with, it’s just designed really well. It’s surprisingly quiet and it has a great storage space for the various tips that are included. Let’s talk about those tips. You get 12 in all, including periodontal and orthodontic tips. It runs at a 1200 pulses/minute frequency, which surveys have indicated is the most comfortable one. Another great thing about this one is how long the reservoir lasts - 150 seconds with each fill! There are 5 different pressure settings to choose from and even an easy to activate pause button in case you need it. The water control is on the handle so it’s easy to change it while you’re using the flosser, too. 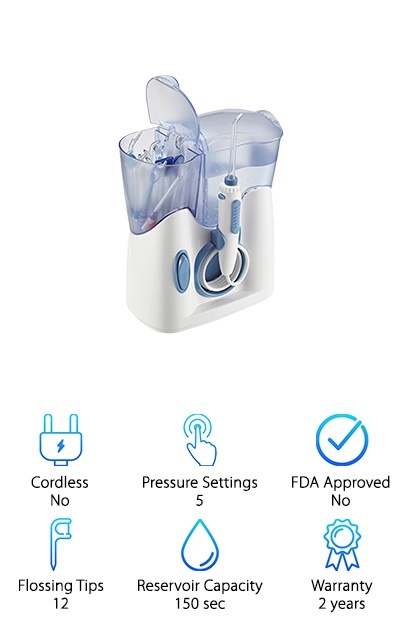 If you’re looking for the best portable water flosser or even the best cordless waterpik, look no further than this Oral Irrigator from Poseidon. It’s a simple, basic design that’s great to pack with your toiletries when you go on vacation. The charging base has a small footprint that won’t take up too much room on your bathroom sink or countertop. Because the flosser is cordless, it’s a little easier maneuver. One of the great features about this is the automatic 2-minute shut off so you know when you’ve completed a cycle. There are 3 different settings; normal, soft, and pulse. Plus, it comes with multiple color-coded tips so more than one person can use it. This is a great choice for someone with braces or dental work like bridges or caps. This flosser from Lifestance is another great choice if you’re looking for the best waterpik for braces. It comes with 3 different modes (normal, soft, and pulse) and cleans deep below the gumline with a powerful 3000 pulses per minute. 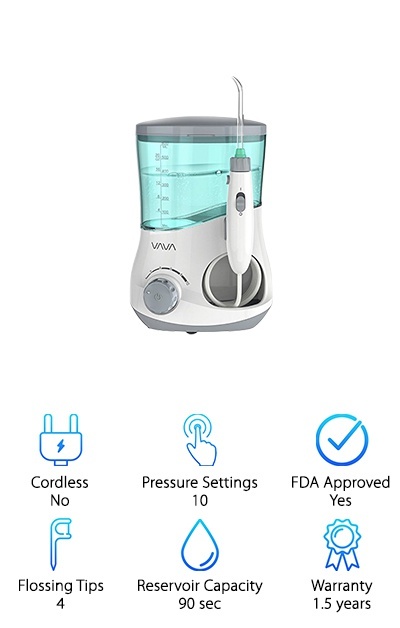 It’s the unique combination of pulses and water pressure that makes this water flosser so effective. This is a good one for a family because it comes with 4 different flossing tips that are interchangeable so everyone has their own. Because it’s cordless, it’s easy to travel with. Plus, if you’re one of those people who like to brush their teeth in the shower, this one can go right in with you. (Yes, brushing your teeth in the shower is a thing.) It’s even safe to use on veneers, implants, or braces. One more thing: it’s FDA approved. 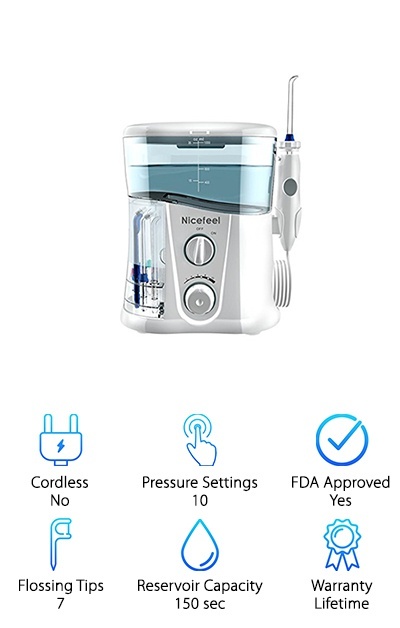 The Nicefeel Water Flosser has a cool design that keeps everything you need right in the device without taking up too much counter space. There are a lot of really cool features, too. One of the things we liked the most is the 360 rotating control knob which makes it really easy to clean even the hardest to reach areas of your mouth. You can customize it with 10 different pulsating water settings and it comes with 7 different tips. These include an orthodontic tip that makes this a great choice for someone with braces. It also comes with 3 standard high-pressure tips that are color coded so multiple people in one household can use the same flosser. One more thing. You get a 1-year money back guarantee and a lifetime warranty. 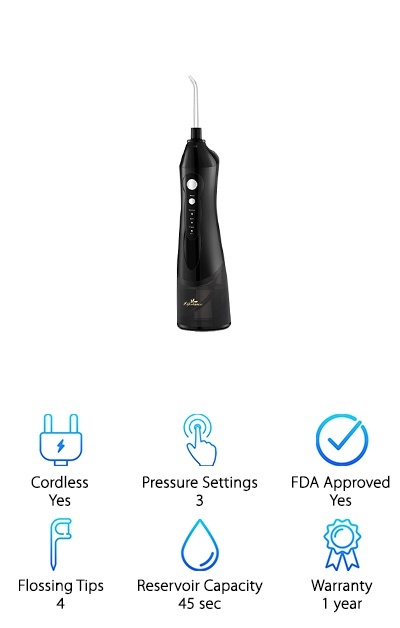 Here’s another choice for best cordless water flosser if you want something portable that takes up a little less counter space. The long nozzle is really easy to use and the ergonomic design feel great in your hand and gives you a little bit more control. It also helps you get to those hard to reach areas in the back of your mouth. That’s one reason why this is a great choice for people with braces. It can get to places that you just can’t reach with floss and a standard toothbrush. Because this is cordless, it’s easy to travel with. Just toss it in your toiletries bag. The automatic turn off feature saves you from depleting the battery. That’s not all. This one comes with a 30-day satisfaction guarantee. For a cordless water flosser that will hold its charge for a long time, try this one from Azorro. There are 3 different pressure modes and with the LED indicator, it’s easy to switch from one to another. 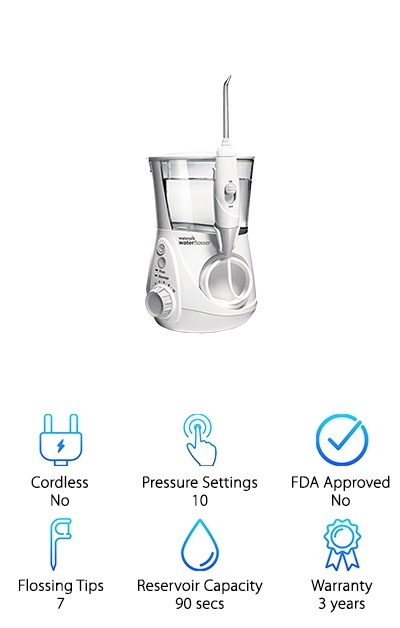 This water flosser uses a unique combination of pulsations and pressure to effectively clean between your teeth and down into your gums. It comes with 2 jet tips, color coded pink and blue so that two people can share one unit. The tank holds 135 ml which is just about enough water for one full cycle. This one is safe to use with braces, dental implants, and bridgework so you can continue to take good care of your teeth even with your dental devices in place. One more thing, it’s FDA approved for oral use. This cordless water flosser from Panasonic has 3 pressure settings: deep, for targeted cleaning; normal, for everyday use; and low speed, for little kids or anyone who finds that their gums are too sensitive to the more intense streams. The design is 100% waterproof so you can use it in the shower and run it under water for quick cleaning. Worried about how to clean the reservoir? Worry no more, this one is dishwasher safe. It pulses at 1500 times a minute to wash away plaque and leftover food particles while still being a great choice for anyone with braces or other dental work. It’s cordless, which means two things. One, it’s portable. Just toss it in your toiletries bag and go. And, two, it’s easy to maneuver because nothing’s holding it back. 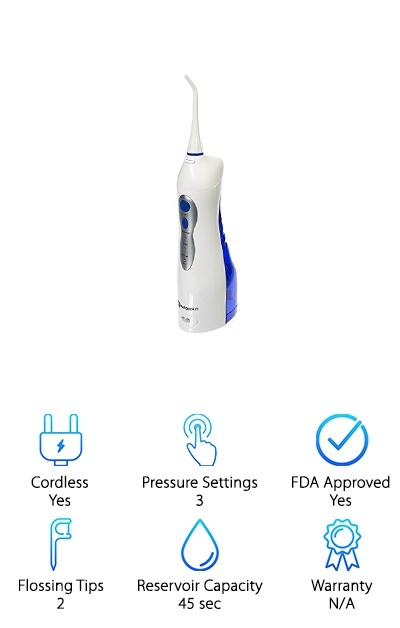 MOROCHO’s cordless water flosser is loaded with some impressive features. With 3 cleaning modes and high-pressure pulsed water, it can remove up to 99.9% of plaque and food debris. There are 5 tips included with this and it’s ideal for multiple users. In all, you get 2 classic tips, 2 jet tips, and 1 periodontal tip. One of the things that impressed us the most about this one is the battery life. When used efficiently, a full charge can last up to 2 weeks. This makes it exceptionally good for travel because you don’t even have to worry about bringing along a charger. But, if you want to bring it along, toss it in the included travel bag and you’re all ready to go. Get this: it uses a simple USB charger. 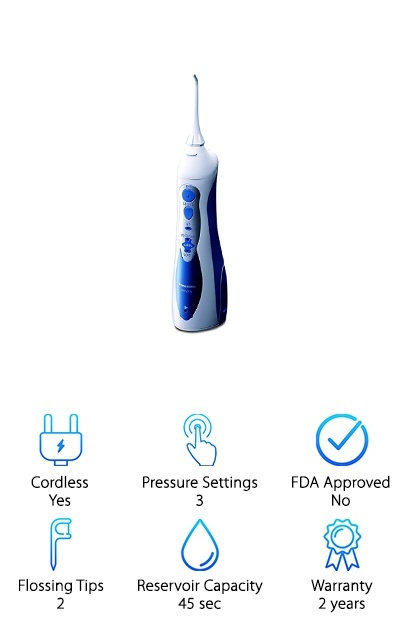 If you’re looking for a good family option, this water flosser from VAVA might be just the one you’re looking for. It comes with 3 different color-coded jet tips so each person can use a different one on the base. It also has 10 different settings that range from lighter for kids and more intense for adults. One of the great things about this model is how big the reservoir is. It holds 600 ml of water in total and lasts about 90 seconds. This is pretty large reservoir but don’t worry. It has a built-in tank valve so it won’t leak. Its splash proof build makes it somewhat water resistant so you don’t need to worry about water splashes. And get this: the flosser easily attaches to the base with a magnet.